Take exit 62 for Buckland Road and follow the long off ramp until the end. Turn right and follow Buckland Road until the intersection with Tolland Turnpike (there will be an Agway and Honda dealer across the road). Turn left and follow Tolland Turnpike about 0.3 miles until a light. Go straight at the light and you are now on North Main Street. Follow North Main Street 0.9 miles and turn left onto Union Street. We are the big yellow house at the corner, our driveway is the first right. Take exit marked 62 & 60 for Route 44 and Buckland Street and bear right onto Exit 62 for Buckland Street. At the end of the ramp turn right and follow Pleasant Valley Road until the next light (there will be an Exxon station on right). 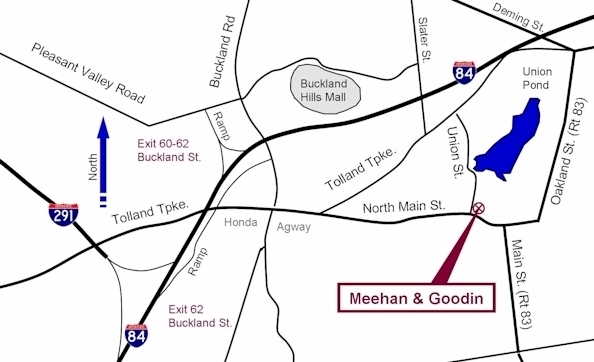 Turn right onto Buckland Road continue about 0.7 miles until the intersection with Tolland Turnpike (there will be an Agway and Honda dealer across the road).